VICTORIA - A dress code protest at British Columbia's legislature that prompted some women to roll up their sleeves in solidarity on Thursday has resulted in the Speaker's office ordering a review of modern dress expectations at the building. Acting clerk Kate Ryan-Lloyd said Speaker Darryl Plecas directed her to review the legislature's dress code policy to determine what is considered appropriate business attire for women. She said the current policy dates back to 1980. The review comes after at least seven female legislature journalists and one NDP staff official wore short-sleeved attire in defiance of the dress code. Several members of the government's staff said they were approached recently by sergeant-at-arms staff and advised it's against the rules to wear short-sleeved clothes in the legislature and were told to cover up. Finance Minister Carole James said a dress code review at the legislature is long overdue. She said she regularly wears pants and comfortable shoes to the legislature because pants are more comfortable during days that involve moving from office to office. James said she does not wear high heels because she has long-term issues with her ankles and feet. James said she was wearing a sleeveless blouse under her blazer. Last year, the legislature unanimously supported allowing politicians to bring their babies into the chamber during debates. “When I was first elected, we were still dealing with converting some of the washrooms to women's washrooms,” said James. Sonia Furstenau, a Green member of the legislature, said on Twitter that one of her staff was recently told by a member of the legislature staff to wear a slip under her dress because it was clinging to her legs as she walked. Acting sergeant-at-arms Randy Ennis said members of his staff have been enforcing the decades-old business attire policy and telling women to cover up. “It goes back to what would be suitable for MLAs to be wearing in the chamber, the female staff or female members of the assembly,” he said. The dress policy from 1980 states that business attire generally constitutes layered clothing that includes covered shoulders. 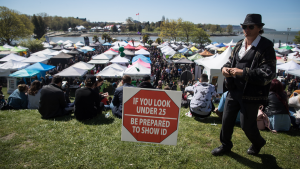 “For an individual who identifies as a woman, this would typically include a business suit, dress with sleeves, or a skirt with a sweater or blouse; jackets or cardigans are not necessarily required,” the policy states. 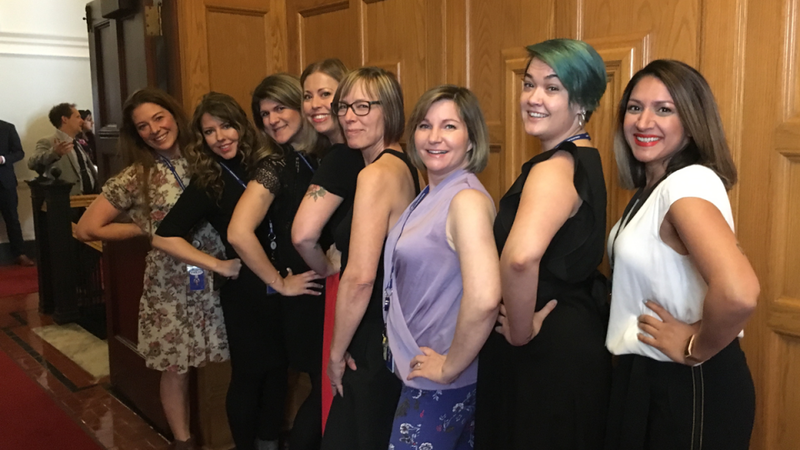 Reporter Shannon Waters said she and her female colleagues decided to challenge the dress code after hearing about a senior NDP staff official who was told her short-sleeved shirt was not appropriate for the legislature. The office of the sergeant-at-arms recently circulated a media conduct brochure that said men must wear shirts and ties but made no mention of a dress code for women. Note: CTV Vancouver's Bhinder Sajan was among the reporters who wore short sleeves on Thursday, but did not contribute to this story.